The Arts and Crafts Movement originated in England largely inspired by two figures— art critic and Gothic enthusiast John Ruskin (1819-1900) and artist/socialist William Morris (1834–1896). 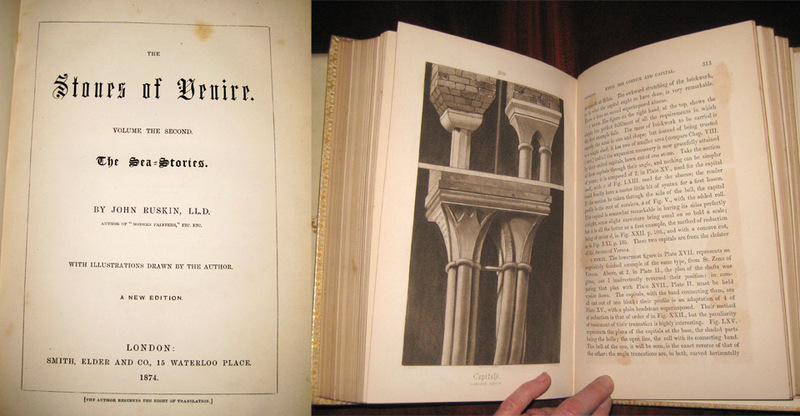 Ruskin planted the seeds of the Arts and Crafts anti-industrial sentiment in the second volume of his treatise, The Stones of Venice. He glorified the Gothic craft workers’ individual freedom of expression through direct contact with their product as opposed to the degradation of late 19th century industrial workers who merely fed materials into machines that were programmed to do the making. In 1891 Morris started the Kelmscott Press, a private press dedicated to excellence in book production encompassing all aspects of book design— paper, typography, illustration, page layout and binding. His books were essentially art objects meant to be appreciated for their form as well as content. A trio of Arts and Crafts printed works. 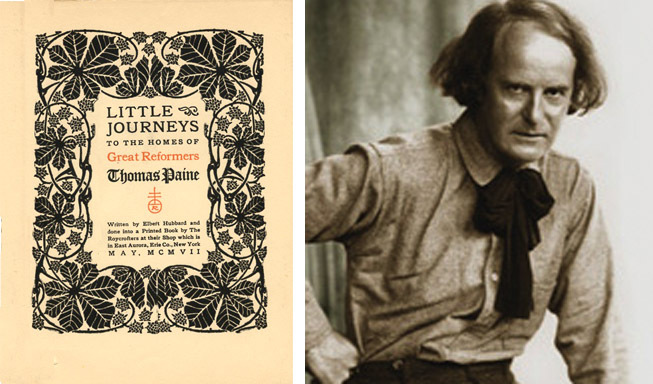 In the center William Morris revives the medieval manuscript which is later emulated by (left), Elbert Hubbard and less so by (right), Gustav Stickley. Between 1895 and 1905 over 130 similarly minded organizations sprang up across Britain and many more were established in Europe and across the Atlantic. In the United States each new community reflected the ideals of Ruskin and Morris as seen through the filter of the American founder’s own vision. 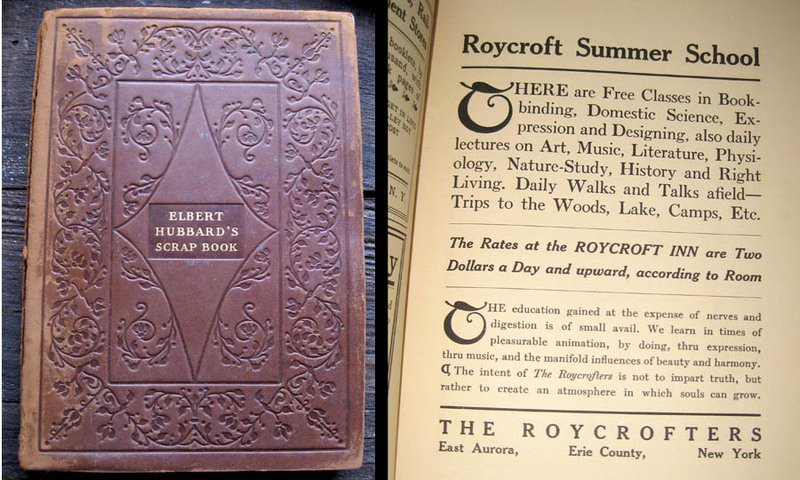 Elbert Hubbard, initiator and spiritual leader of the Roycroft Community, established the successful Arts and Crafts center using his considerable entrepreneurial and self-promotional gifts. Although Hubbard’s methods were sometimes seen as crass, it is undeniable that he was the first to introduce the ideals and aesthetics of the Arts and Crafts Movement into the homes of the average American. An ingenious promoter and advertising copywriter at Larkin Soap Company, by age 36 Hubbard was successful but frustrated. He lucratively cashed out of Larkin and enrolled in Harvard to pursue his dream of becoming a serious author. University life was not a good fit for the strongly opinionated Hubbard, especially after his professors informed him that he would never amount to much as an author. After a short three months in academia he set off to roam about England while writing a collection of short essays, Little Journeys, recounting his visits to the homes of famous individuals. Some of the articles were from first-hand observation and some were “phantom trips.” There is some question as to whether he actually visited William Morris’s Kelmscott Press, but nevertheless he returned to the US with an epiphany—he would set up his own press and self publish just the same as Morris. We arrived in town by car having prearranged a tour guide over the internet, ($10 per person, 2 tours daily, reservations suggested). The parking lot of the Gothic and Tudor style campus was filled, not for campus tours, but for the Sunday brunch being served in the Roycroft Inn across the street. There one can dine in the original eating hall accompanied by a live musical ensemble and surrounded by various Hubbardesque homilies carved into heavy oak panels. We didn’t eat there but it looked inviting. We met our volunteer guide in the large and plentiful gift shop and were given a thorough background on Hubbard and the community. Although by 1910 the community grew to over 400 workers who produced furniture, pottery and metal-work, the press was the origin and anchor of Hubbert’s venture. We proceeded first to a display set up next to the gift shop. Having read that in its day the press had employed over two hundred workers we were surprised by the meagerness of the print area of the tour. A few small presses sat behind a rope, a Pearl taking center stage, but it did not reflect the importance that printing had in the community. Hubbard established the Roycroft printing shop with printer Harry Taber to publish The Philistine: A Periodical of Protest, a mouth-piece for his considerable opinions. The publication grew into a successful enterprise gaining a circulation of 200,000 by 1911. Another monthly project, The Fra, was titled after a name he fancied for himself, Fra Albertus. The name Roycroft was derived from London printers Samuel and Thomas Roycroft (active 1650-1690) but the name was applied to all products of the community, made in what Hubbard referred to as the Roycrofty style. Roycroft books are relatively easy to find, this copy was purchased in New Orleans. The text is peppered with ads for various Roycoft goods, in this case promoting the Inn with the lure of free classes. What Hubbard wanted most was to print books, and like the Kelmscott Press, to make books that were objects of art. With no printing or illustration background himself, Hubbard gathered a talented staff including book illustrator William Denslow, book designer Samuel Warner and most notably Dard Hunter—later to become a preeminent authority on papermaking. Hubbard’s wife, Bertha, and artist William B. Faville beautifully hand illuminated the press’s higher end editions. In the illuminated books Hubbard worked hard to emulate the style of Morris, including many decorative borders and manuscript type layouts, but the results were often a bit ham-fisted in comparison to Morris. One has to recognize that William Morris was a wealthy well educated aristocrat while Hubbard was a self-made man from humble beginnings. There was certainly a sensitivity and taste gap between the men in a number of areas. Illustrators Clara Schlegel, Bertha Hubbard and William Denslow. Hubbard’s folksy no-nonsense writing style was popularly successful especially after his 1899 essay, A Message to Garcia became a mega hit selling over 40 million copies. Hollywood even filmed the silent movie version. The essay—”a preachment” —was hastily written by Hubbard in one hour to fill a blank space in The Philistine. Basically the essay is a parable about what makes a resourceful and loyal employee; a person who follows orders without question. The essay was purchased and distributed in droves by corporate bosses eager to squeeze more productivity out of their workers. Printed pamphlets were mass ordered by both the US and foreign armies—jobbed out to large printers who could handle the volume. You can read the entire essay here. Our guide explained the various campus expansions as Hubbard popularity rose to cult status and more and more visitors made the trip to experience the Roycroft world. To accommodate these travelers an inn was built and furnished with simple furniture manufactured in the compound. The furniture and all of the Roycrofty crafts were designed in the American version of the Arts and Crafts— straightforward, sturdy and simple. During periods when the venture was not consistently profitable Hubbard augmented the operating funds from his salaries as a columnist for the Hearst newspapers and popular national appearances. A meeting place, The Chapel (an old term used by printers for their shop), was constructed for concerts, community gatherings and addresses by Hubbard. Visiting lecturers included luminaries Clarence Darrow, Clara Barton, Thomas Edison, and Carl Sandburg. In 1910 the Powerhouse supplied heat and electricity to the campus. We were not able to see it due to renovations but it will reopen in April 2012. Beyond the idealistic mission of the Roycroft community lies the reality that there is no such thing as Utopia when humans are involved. While Hubbard certainly dressed the part of the artist— sporting long hair and wearing his signature large floppy bow tie and broad-brimmed hats —he was not formally trained and the work produced under his management was artistically uneven. He was known to appropriate phrases from authors and rework them as his own. He was a polarizing figure : for some he was a true prophet of the Art and Crafts but to others a mere poseur (a sentiment William Morris’s daughter claimed her father held). He left more than a few enemies and victims in his wake. Henry Taber, his embittered partner from the establishment of the Roycroft press complained that both his money and plans were usurped by Hubbard. Hubbard’s first wife Bertha suffered through divorce and scandal resulting from his 15-year affair and illegitimate child with school teacher Alice Moore. Although Bertha was well liked and contributed much to the initial establishment of Roycroft she was cleverly maneuvered out of the community by the new Mrs. Hubbard. The mutual interests of writing and publishing which initially brought Hubbard and Alice together led to their demise in 1915. They chose to travel to Europe to cover World War I and to attempt to interview the Kaiser despite government warnings that ship passage to Europe was dangerous. Hubbard and Alice boarded the Lusitania and died when the ship was torpedoed off of the coast of England. Without Hubbard’s leadership the Roycroft, the largest and most successful of its type in the US, the village devolved into financial ruin. The business was sold at auction in 1938 and later went into bankruptcy. The campus laid dormant. In 1986 it was designated as a National Historic Landmark and is in process of total restoration. Currently a group of artisans sell hand crafted goods using the Roycroft trademark. Our tour was well over an hour, the guide was generous with her time when she recognized our interest was more than a casual outing. We were set free to wander at our leisure but we soon left to follow the siren call of Buffalo wings and beef on weck at the Anchor Bar—not on the menu at the nearby Inn. Gustav Stickley, the oldest of several brothers who manufactured furniture, opened his own venture in 1888 with partner Elgin Simons. Like Elbert Hubbard, Stickley traveled abroad but upon return his interest focused upon developing what he termed “New Furniture.” He produced a simple, clean and functional style (also called Mission Style, a term he despised) that is most strongly associated with his name. Stickley, who left school in the sixth grade and was mostly self-taught, built his reputation and career through hard work, self-education and fortunate associations. Unlike Hubbard he was not a relentless self-promoter or a natural marketer but a working craftsman and naturalist. We arrived at Craftsman Farm (or the 30 acres that remain of it from the original 600) on an unusually warm Sunday in March. Access off of 78 was easy— only a few miles past chain restaurants and shoppingcenterville are well-marked signs for the turn into a drive shared with a housing development. The property is a public park where one can stroll freely around the buildings and grounds. The present falls away as you walk down a path to a quiet arrangement of modest period bungalows and the 1911 log house made from local stone and wood. Admission to the house and tour tickets are sold in the gift shop and no food is available on the site. At the start of the tour our guide described Gustav Stickley as the Martha Stewart of his time and indeed the two do have some similarities: a respect for quality, a magazine to promote a tasteful home and a passion for gardening. Mr. Stickley, however, was deeply grounded in the aesthetics and social values the Arts and Crafts movement. to be the main lodge of a boys school. As we entered the home our first stop was an enclosed porch. In the small written introduction we read about Mr. Stickley’s career trajectory. After almost two decades of successful manufacturing of revival furniture Stickley found a desired style change through his acquaintanceship with two individuals, Henry Wilkinson and Irene Sargent. Mr. Wilkinson was a graduate of Cornell’s architecture department and an admirer of John Ruskin’s neoGothic persuasions. As the first designer hired by Stickley, Wilkinson set the tone for the future Craftsman Furniture Company. The company began to offer their progressive furniture designs finished in a special (and toxic) ammonia-fumed quartersawn white oak and native woods. 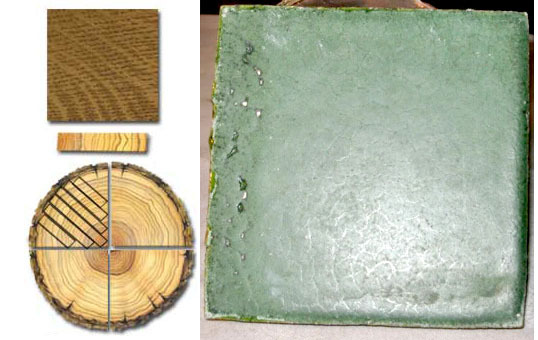 Much as his contemporary at Roycroft, Stickley blended hand-made processes with machine manufacturing techniques to bring his product within the reach of middle class consumers. Gustav’s logo before he dropped the e from his name. Stickley was deeply influenced by Miss Irene Sargent, an art history and French professor at Syracuse University who lead a local group of Arts and Crafts enthusiasts. A highly intelligent and educated individual, Sargent had studied at the Sorbonne, the University of Rome and under Eliot Norton, a Harvard art history professor who was friends with both John Ruskin and William Morris. Although Stickley’s initial contact with Sargent was to study French for an upcoming trip to Europe, she later introduced him to the philosophy of the Arts and Crafts Movement. 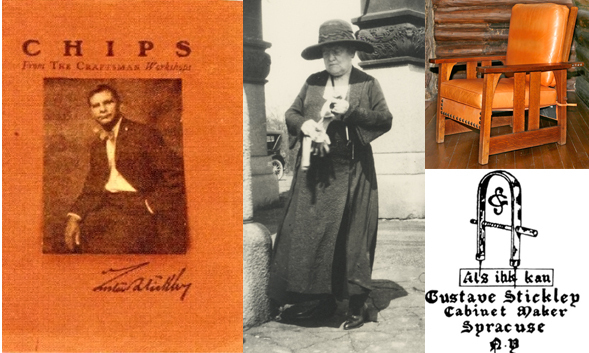 Sargent’s mentorshop and her working relationship with Stickley was intense for several years. In 1901 she wrote the text for Stickley’s first publication Chips from the Workshops of Gustav Stickley for neither pay or name credit. It is quite obvious when reading the text—with references to Greece, the Middle Ages and historic European styles—that it was not the product of an elementary school education. In the same year she became the de-facto author and editor of early editions of Stickley’s magazine The Craftsman, the most important publication from the Arts and Crafts movement. For five years she wrote the lead articles covering topics of interest to the home decorator—furniture, architecture, pottery, textiles, basketry, jewelry, stained glass —in essence creating a home life style magazine. After 1905 Ms. Sargent disassociated herself from further Stickley publications for reasons unknown. In the January 1904 issue Stickley featured the first official Craftsman Home and after that featured at least one house a month. Subscription holders were entitled to one free building plan per year. Approximately 221 plans were published, resulting in an explosion of Arts and Crafts homes, mostly in suburban areas around cities. In 1905 the Stickley moved his headquarters to New York City and three years later he began acquiring the land for Craftsman Farm with the dream of building a school of citizenship for young boys. 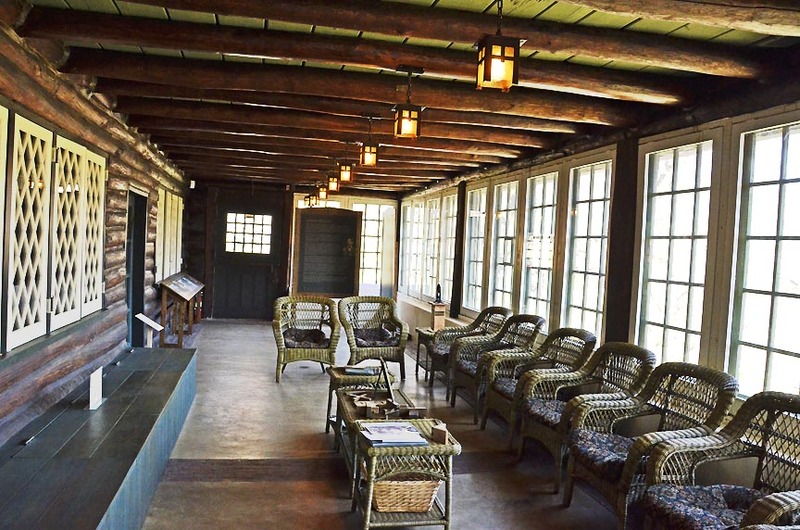 Stickley wanted to blend academics with farming to teach the values of both life and nature. Our guide explained that when the boys’ school concept proved unworkable the Stickley family moved from Syracuse to Parsippany. A glass display case held a tea service set used in the Craftsman restaurant on top of the Craftsman building in Manhattan. Starting in 1913 the restaurant served dishes made from the vegetables, meat, eggs and milk produced on the New Jersey property. No pictures are allowed inside the home but you can see many of the furniture pieces on the Stickley Museum web site and in various decor magazines on-line. The entire home is one big Arts and Crafts Gesamtkunstwerk— from the heavy copper hooded fireplace, rug patterns, textiles, lamps, even the piano. Mottos and slogans are hammered into the fireplace covers. Some of the furniture was inlaid with pewter and colored woods— the work of the gifted but troubled Harvey Ellis. We spied a complete set of Elbert Hubbard’s publications but when asked if Stickley was a fan, our guide informed us that much to the contrary Mr. Stickley did not appreciate the promotional manner Hubbard placed his logo front and center on his work, nor the self-promotional practices of the Roycroft leader. It is unlikely the collection belonged to Stickley. Since interior images are not allowed we can only point you to the source of these images, antiquesandthearts.com. The piano shows inlaid work. The dining area walls are exposed logs. When both the Craftsman style and national economic bubbles popped in 1915 Stickley was forced to declare bankruptcy and sell Craftsman Farms two years later. He spent the rest of his years living with his daughter in Syracuse, New York. He ceased manufacturing furniture but still experimented with potential wood finishes. The farm was preserved from development by a band of local citizenry who urged the township of Parsippany-Troy Hills to obtain the property through eminent domain. They are working hard to expand the preservation beyond the main house and promote the site as a destination. After the tour there are 2 small cabins you can explore from the exterior. The staff was very nice. Our guide was very knowledgable and answered all of our questions. When we realized that we had a problem with our car alarm we had to tie our little dog up at the front door. The lovely lady at the desk pitched in to keep an eye on her for us. Civility circa 1900!